The trial: Palacios v. Kaufman. The verdict: After more than 12 hours of deliberations, jurors cleared Powell’s clients, a pair of anesthesiologists accused of medical malpractice, in the $27 million trial. The details: Esmeralda Palacios, a former loan officer with a history of asthma, suffered catastrophic brain damage during a 2012 surgery when a bronchospasm, or spasm in her respiratory system’s bronchioles, deprived her of oxygen. Powell’s clients, Drs. Laura Kaufman and Donald Silverman, were accused of failing to promptly inject Palacios with epinephrine in time to avoid her catastrophic brain damage. However, through expert and witness testimony during the week-long trial, Powell and the defense team worked to establish the physicians followed proper protocol in treating Palacios’ broncospasm, including administering both albuterol and at least four doses of epinephrine to Palacios. Powell’s masterful work in the courtroom helped his clients prevail in the case and earns him the distinction as CVN’s Defense Attorney of 2016. The award is the second in a row for Atlanta’s Huff Powell Bailey. 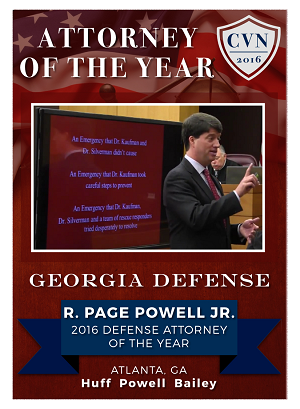 CVN named Powell’s partner, Daniel Huff, its 2015 Georgia Defense Attorney of the Year.